So, you are halfway through your swimming season, and you walk outside to take a dip in your pool, and you notice your pool cover is starting to look a little unsightly. Your first thought may be that it’s time to get a new one, however, that may not necessarily be the case. With Cutting Edge Pool covers they are designed with thermo-tex technology which makes these more durable then your standard pool cover. 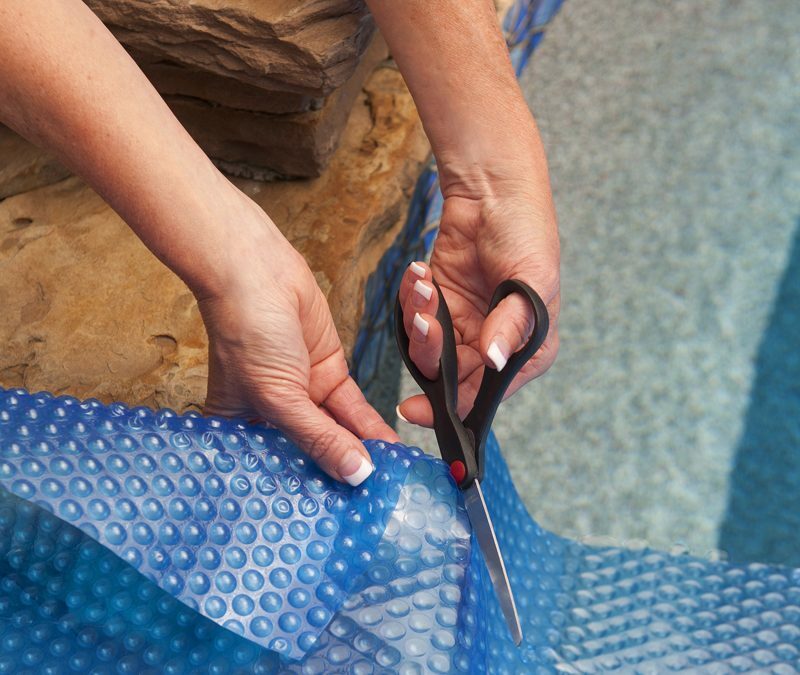 Instead of replacing it, follow these tips to get the most use of your pool cover. While Cutting Edge pool covers are designed to help resist damage from pool chemicals, care should still be taken, especially if you have just shocked your pool. Instead of super chlorinating your pool and immediately throwing your pool cover over it, allow your water to breath and your chemical levels to settle before you put on your solar pool cover. Your first temptation after taking off your pool cover may be to roll it into a ball and throw it on your deck. This does not bode well for the life expectancy of your pool cover. When your bubble pool cover is treated this way, you end up getting abrasion from your check and wearing out the air-filled pockets (bubbles) which lowers the life of your cover. Instead, these should be folded and put into a smooth area out of direct sunlight so you can enjoy the solar benefits for years to come. If you are expecting to store your blanket long term (in the winter months), you want to lay it flat out in the sun and allow it fully to dry. We don’t mean clean it every day, but you should clean it every month or so. The easiest way to tell if your pool cover needs cleaned is if you see any visible dirt or debris on your cover. As your swimming season continues, you still inevitably get some build up on your cover. By routinely cleaning your pool cover, this prevents mildew and algae build up. Cleaning your bubble pool cover couldn’t be easier. You want to make sure that you lightly scrub your solar blanket with a soft brush or rag and some clean cold water. Make sure you do not use any harsh chemicals as this can expedite the breakdown of your pool cover.